A sold-out crowd of 1000 plus have converged again upon the famed Turbinenhalle in Oberhausen, one of the biggest crowds in company history partly thanks to a big traveling contingent from elsewhere in Europe. A sold-out crowd of 1000 plus have converged again upon the famed Turbinenhalle in Oberhausen, one of the biggest crowds in company history partly thanks to a big traveling contingent from elsewhere in Europe. With an incredible professional setup with lighting rigs and video walls the likes of which wouldn’t look out of place in WWE, we’re set for three days of sixteen man tournament action, with the best in European and World Wrestling at the famed Oberhausen venue. We opened with 16 Carat Round One as Keith Lee defeated Avalanche in a big man match built around hard hits and big bumps as both men attempted to move the other with power moves, culminating in a huge response for an Avalanche Body Slam to Lee. Avalanche a cult favorite both to the German and traveling fans were hugely over here so it was somewhat of a surprise to see Lee win clean with his Fireman’s Carry into Body Slam, Strong Zero finisher. Up next, in tournament action, Chris Brookes defeated Alexander James via his Double Underhook Piledriver, Praying Mantis Bomb. This was a short match, with the popular Brookes who lost teeth and gained stitches in an Inner Circle match the night before, marking his 16 Carat debut with a big win. We then had one of the strongest matches in Round One as Lucky Kid defeated Matt Sydal, in a match where the Turbinenhalle crowd was particularly one-sided, desperate for the underdog Kid to advance, culminating in groans when Sydal went up top to go for his Shooting Star Press finish and then elation when he missed and was rolled up by Lucky Kid with a Small Package, in a tournament upset against the Impact X-Divison champion. The last 16 Carat tournament match of the first half saw David Starr defeat Emili Sitoci, with Sitoci being a late alternate winning a four-way match before the main show, beating Julian Pace, Ivan Kiev and Julian Nero. This was necessary due to an injury to Jurn Simmons, which meant the planned grudge match main event of Starr and Simmons was now off. Starr defeated the veteran of the European scene with his Han Stansen Lariat to continue on in a tournament where he is favored by many to ultimately win. The first half was then brought to a close with non-tournament action as WALTER and Speedball Mike Bailey defeated Bad Bones John Clinger and Bobby Gunns with Bailey pinning Gunns via Moonsault Fallaway Slam in a strong match mainly built around two singles feuds with Shotgun Champion Gunns due to defend against Bailey and Unified World Champion Klinger due to defend his title against WALTER in the main event of Night Two. The second half started with a bang as Matt Riddle defeated Da Mack of WWE Cruiserweight Classic fame, in a matter of seconds with the opening move of the match, a huge running knee, to eliminate the much-hated Mack to the delight of the crowd. This had echoes of Riddle’s defeat of Trent Seven in last year’s Progress Super Strong Style 16, whom he beat with that same knee, in a similar6-second match. Travis Banks then defeated Mark Haskins in a more competitive match from two men very familiar with each other having wrestled matches like this in numerous companies around he world, with Banks advancing via an avalanche version of his Kiwi Crusher finisher after a very strong back and forth match. The penultimate match saw Tim Thatcher defeat Jonah Rock in a match with great story as the big man Rock, continuing his tour of Europe used his size and surprising agility to dominate Thatcher, eventually taking one risk too many from the top rope, hitting a Frog Splash to the knees of Thatcher and being caught in an Armbar for the tap out loss. Thatcher was particularly popular here with an incredible promo video being shown before the match with him explaining why he needed to win this tournament and advance past the first round, rallying his adopted home town crowd behind him. Finally, in a heated grudge match of a main event that toured the floor of the Turbinenhalle with big bumps and dives on and around the stage area and into the crowd, Absolute Andy defeated Marius Al-Ani to take the final place in the 16 Carat second round. Andy’s win was with a low blow and a Superkick, all while Marius had a foot on the rope, to end the first round in controversy and give plenty of room for this feud to continue between the former tag partners. 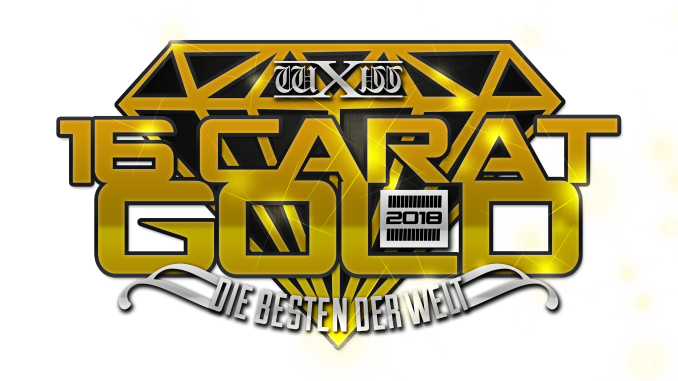 This was excellent heated stuff and a great main event to end the first night of wXw 16 Carat Night One. Night Two will see the aforementioned battle of RISE and RingKamp leaders John Klinger and WALTER for the wXw World title, Speedball Mikey Bailey versus Bobby Gunns for the Shotgun title, Toni Storm versus Melanie Gray for the Womens title and second round action in the 16 Carat tournament with Absolute Andy, Tim Thatcher, Travis Banks, Matt Riddle, David Starr, Lucky Kid, Chris Brookes and Keith Lee making up the unannounced Quarter Final bracket.